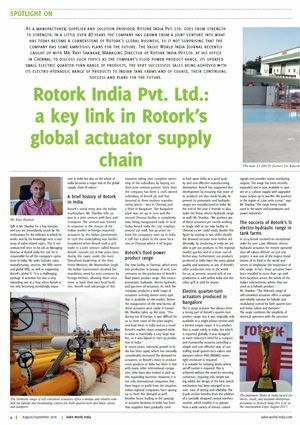 Rotork India Pvt. Ltd.: a key link in Rotork’s global actuator supply chain. As a manufacturer, supplier and solution provider, Rotork India Pvt. Ltd. goes from strength to strength. In a little over 40 years the company has grown from a joint venture into what has today become a cornerstone of Rotork’s global business, so it is not surprising that the company has some ambitious plans for the future.